NetBeans is an Integrated Development Environment (IDE), a software package which can be used to develop programs. Several developers use NetBeans to develop GeoTools itself or GeoTools based software. NetBeans is available from Oracle as a free software download. There are also derivatives such as Sun ONE Studio (previously Forte for J). The GeoTools project offers a great “Netbeans Quickstart” describing how to set things up. NetBeans provides strong maven integration making it an ideal environment to work with GeoTools smoothly and easily. When working on a Geotools / Maven project within Netbeans you can take advantage of the repository search facility to find the Geotools artifact that you need to add to your project for a given class. For instance, say you want to use the ShapefileDataStore class but don’t know the name of the artifact that contains it. In your code, enter the class name followed by a variable name. Netbeans will display the following. 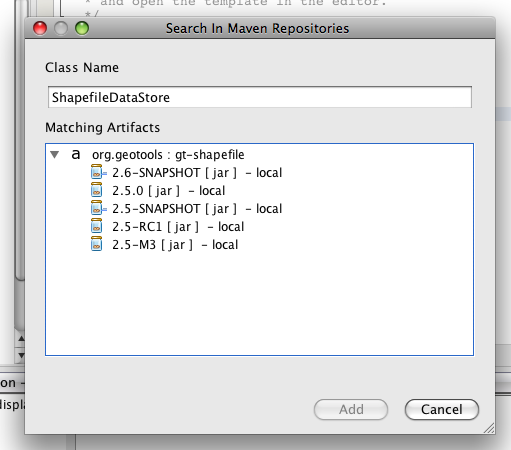 Click on Search Dependency at Maven Repositories and you will get the search dialog. In this example it shows the artifact is gt-shapefile and that there are a number of versions available in the local repository. Select the required version, click the Add button and it will be added as a dependency to your project. Unfortunately, because the Geotools repository doesn’t use the indexing system required by Netbeans/Maven, the search dialog will show matching artifacts that are available to download. When you want to use Geotools class X.from artifact Y (say ShapeFileDataStore from gt-shape). This usually means that the artifact hasn’t yet been downloaded into your local repository. You can confirm this by looking at the node for that artifact in the Libraries section (Project window). Artifacts in the local repository can be expanded to view their contents but those not yet downloaded don’t have the expand arrow next to them. The easiest thing to do is build the project. This will result in Maven downloading the artifact for you. Occasionally Netbeans fails to register that the artifact is now present. Sometimes this can be fixed by going to the Maven Repositories window, right-clicking on the entry for your local repository, and selecting update index. If this doesn’t work, close the project and then open it again. netbeans_default_options="-J-client -J-Xss2m -J-Xms32m -J-Xmx640m -J-Xverify:none "
The current and peak memory usage are shown in the toolbar. You can force the garbage collector to try to recover memory by clicking on the memory widget.